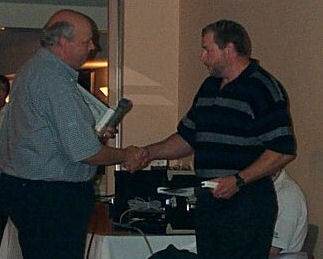 OCOA President Bill Fisher presents CO Dan Slater with a 2001 Lifesaving Award at the Aurora Convention. On January 26, 2001, Conservation Officer Dan Slater assisted in attempting to rescue Park Warden Dee Dunsford, after she had fallen through the ice of Clarke Lake, in Algonquin Provincial Park. CO Slater responded to a call that a tail groomer had broken through the ice of Clarke Lake. The operator of the groomer managed to escape, but the passenger, Park Warden Dee Dunsford, had not. Slater, assisted by other park staff, entered the frigid water and searched for Park Warden Dunsford until he had to be pulled from the water. Although Dee Dunsford tragically lost her life in the accident, Conservation Officer Slater is commended for his courageous lifesaving actions.